An innovative program in northwest suburban Buffalo Grove is saving the lives of shelter animals. CHICAGO (WLS) -- An innovative program in northwest suburban Buffalo Grove is saving the lives of shelter animals. It pairs veterinary interns who need surgical experience with animals who, without the free medical care, may never be adopted. Callie is one the newest patients. She was rescued after being thrown from a 3rd-story balcony. 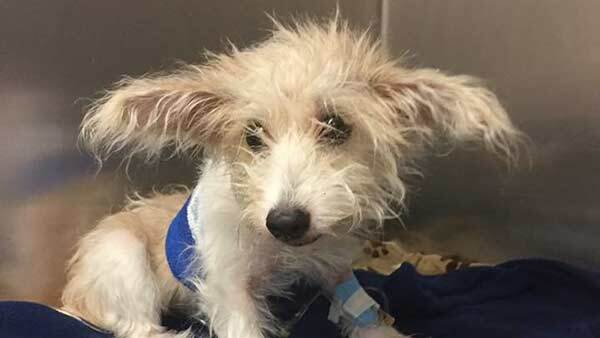 "She had multiple fractures," said Kelly Kellem-Motley, Fetching Tails Foundation. Callie is recovering thanks to Veterinary Specialty Center in Buffalo Grove. They had just started a new program providing free surgical services to rescued animals as part of their training for veterinary interns. "The whole reason we go to school is we love animals... want to be able to help save their lives," said James Karnia, veterinary intern. "Our SASS program is similar to Cornell... pairing vet students with local shelters... in order to train their students as well as provide some care to help these animals get adopted," said Mitch Robbins, director of surgery, Veterinary Specialty Center. Coco is another adorable patient given up by her owners who couldn't afford the medical bills for her bladder stone. "She was in so much pain they removed it," said Kristen Gottschalk, Fetching Tails Foundation. "She's been recovering... and she'll be up for adoption." "We're giving them a second chance to get over that last hurdle that stands between them and their forever home," Karnia said. Coco is waiting to be adopted, and Callie will be up for adoption as soon as she fully recovers from her injuries. Contact Fetching Tails Foundation for information.